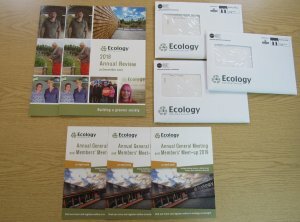 We’re looking forward to our next Annual General Meeting (AGM) and Member’s Meet-up which is taking place at Ecology’s eco-built office in Silsden, West Yorkshire on Saturday 27 April 2019. We’ve sent members their AGM packs which includes our Annual Review 2018 and information on how to vote online as well as details on how to register for the AGM and Members’ Meet-up. As well as the usual formal AGM business and voting, members can enjoy a tour of our eco-build offices and permaculture-inspired garden and our 2019 speakers include leading experts on environmental issues, sustainable housing and behaviour change. They’ll be exploring topics related to this year’s theme: the Triple Bottom Line – how Ecology’s work can support positive outcomes from the perspectives of people, planet and prosperity.